This Korg PC1 Pitchclip Clip-on Chromatic Tuner is a simple, convenient clip-on style chromatic tuner with a compact, lightweight, and discreet design. The clear, bright, and easy-to-read LED display reverses to assure easy viewing when mounted on either side of the headstock. 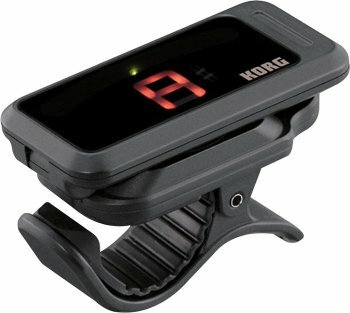 Boasting fast pitch detection and processing, accuracy with ±1 cent, and a detection range from A0 to C8, the Korg pitchclip outperforms many of the clip-on tuners on the market today. By locating the battery compartment in the clip itself, the display unit has become discreet, lightweight, and articulate. The pitchclip's high-contrast LED display can be inverted, assuring clear visibility when mounted in front of or behind the headstock on any instrument - classical guitar, electric bass, ukulele, etc. A single CR2032 Battery provides a generous 17 hours of use; the Auto Power-Off function preserves the battery life.